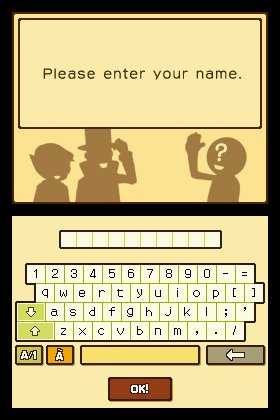 Get your thinking cap on! 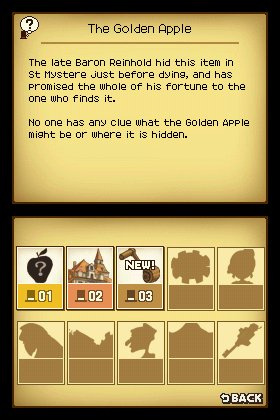 A glass jar holds a single germ. 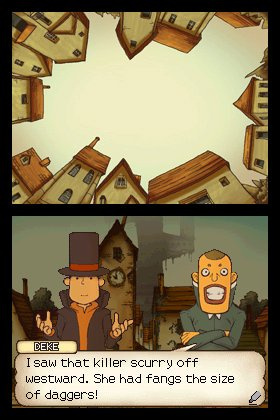 After one minute, the germ splits into two germs. 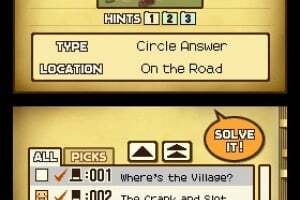 One minute after that, the two germs each split again, forming a total of four germs. 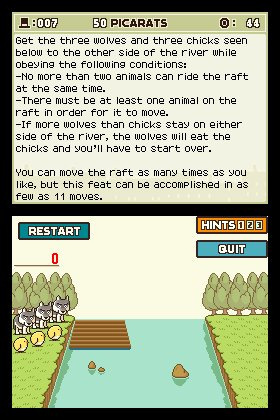 Continuing at this rate, a single germ can multiply to fill the whole jar in exactly one hour. 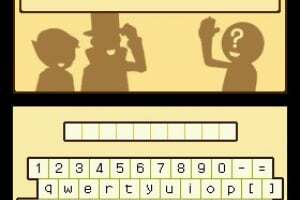 Knowing this, how long in minutes would it take to fill the jar if you had started with two germs? 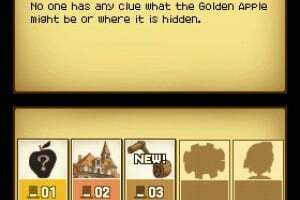 Did you find.. 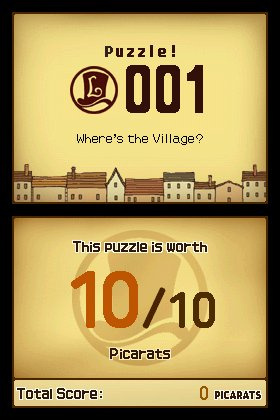 In the curious village of St. Mystere, townsfolk speak to each other in riddles, lock their doors with sliding puzzles and hide their secrets within brainteasers. When a wealthy baron passes away, his will reveals an elusive treasure hidden someplace inside the village. 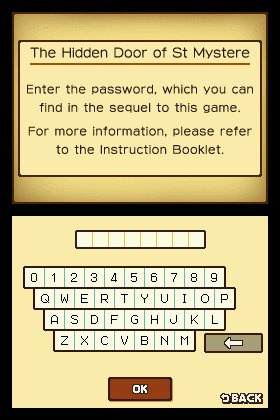 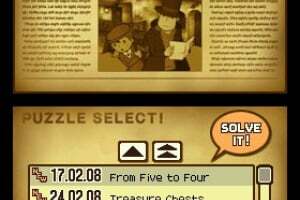 Now it's up to Professor Layton to untangle St. Mystere's riddles and puzzles, find the hidden treasure, and crack the case. 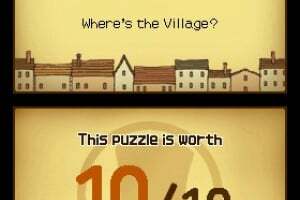 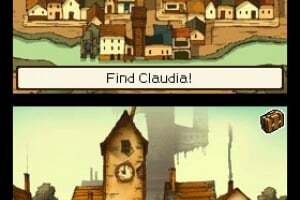 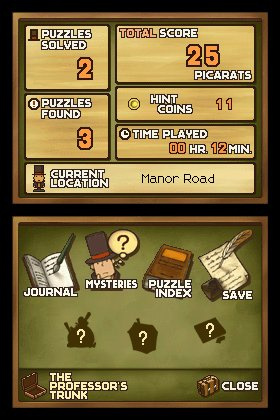 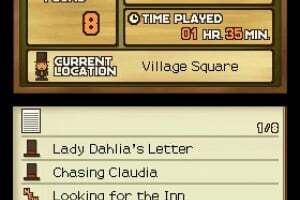 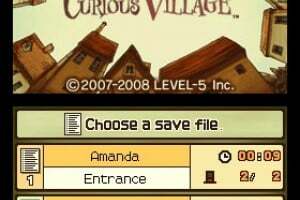 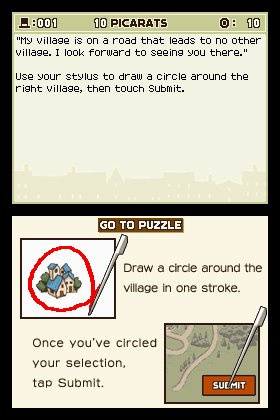 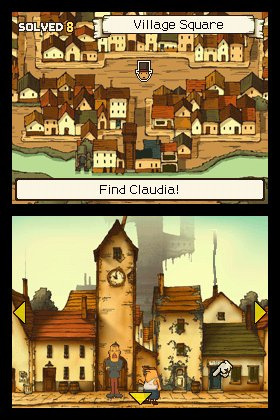 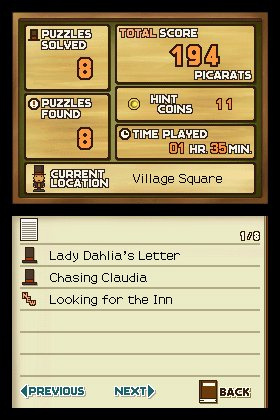 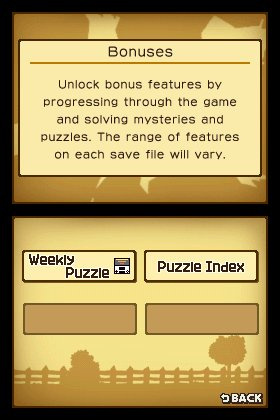 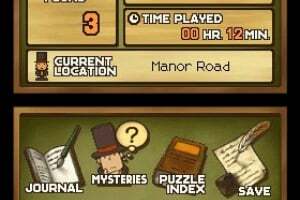 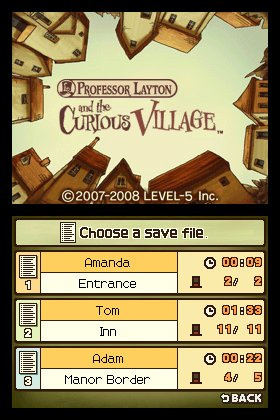 As Professor Layton, players tackle more than 130 puzzles as they unravel the mysteries of the village. 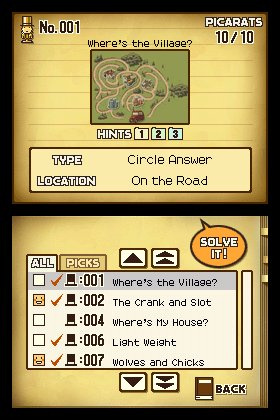 Challenges range from mazes and riddles to logic and sliding puzzles, many of which are new for the North American release. 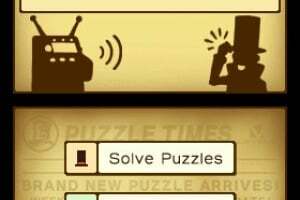 Touch-screen controls make working through puzzles a snap for players of all skill levels, and new puzzles are available weekly for download via Nintendo® Wi-Fi Connection. 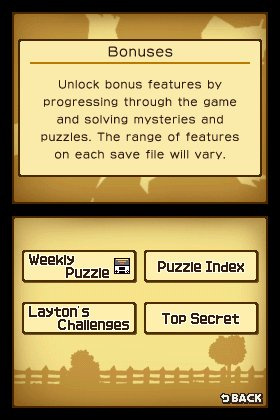 Unlike other puzzle-driven titles, Professor Layton is the first to offer a story, cast of characters and style that are just as strong as the game play. 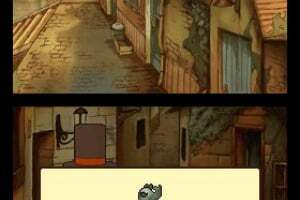 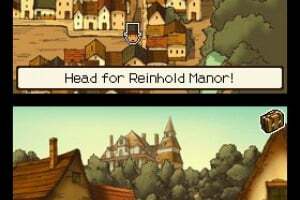 Fully voiced animated scenes bring the story to life, while the funny and eccentric villagers and the classic, hand-drawn art provide a stylish charm that will appeal to gamers and non-gamers alike. 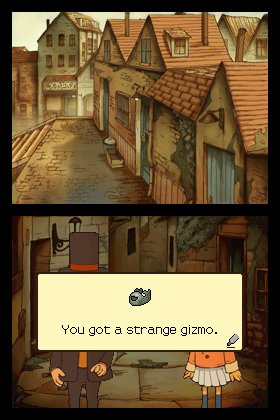 Game storyline: When the wealthy Baron Augustus Reinhold passes away, his will reveals a hidden treasure in the village of St. Mystere. 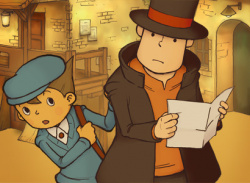 Unable to locate the treasure themselves, the baron's family calls upon renowned puzzle expert Professor Layton and his apprentice, Luke, for help. 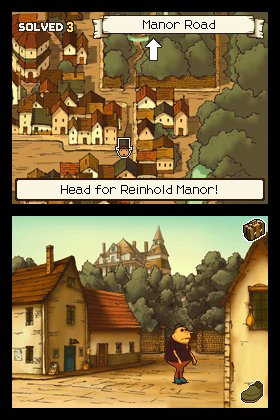 Upon the pair's arrival, their search for the treasure is interrupted by the suspicious death of another member of the Reinhold family. 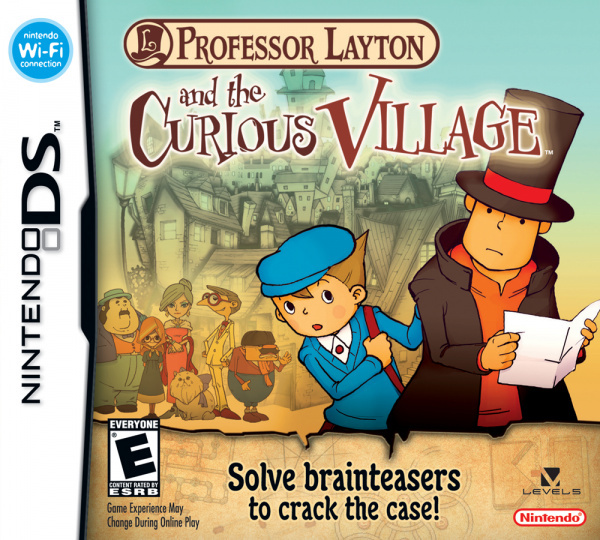 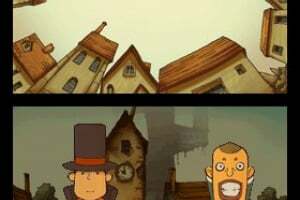 Now with two mysteries on their hands, Professor Layton and Luke must work their way through the village's many puzzles, riddles and brainteasers to find the truth. 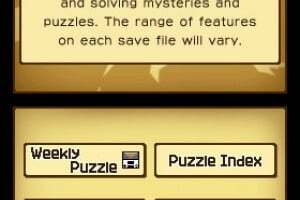 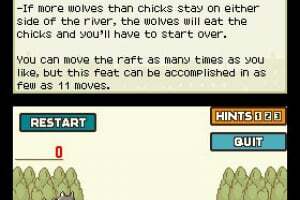 How to progress through the game: The storyline and puzzles are tightly integrated, so that as you explore the world and progress through the adventure, you will encounter more and more puzzles. 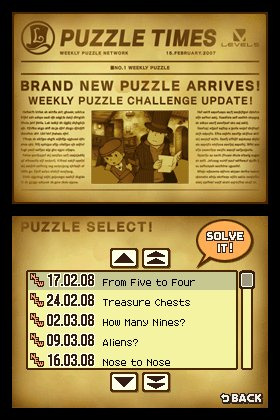 Many of the puzzles are new to the North American release. 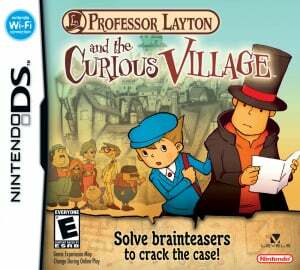 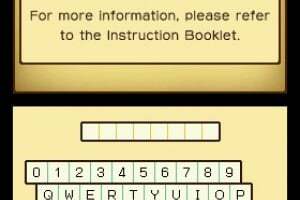 Characters: Archaeologist and puzzle master Professor Layton, his wide-eyed apprentice, Luke, and a host of quirky townsfolk. 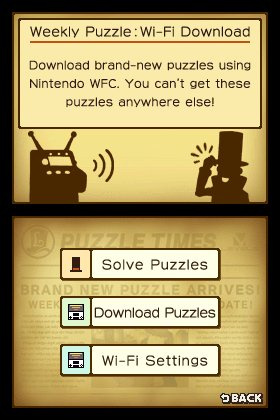 Nintendo Wi-Fi Connection Content: Each week for half a year, a new puzzle will be available for download via Nintendo Wi-Fi Connection.